Born in Brechin as Watson Watt, a direct descendant of the inventor James Watt, he studied at Dundee, at that time an off-shoot of St Andrew's University. He developed an early interest in radio waves and after World War I he began to look into how aircraft could be detected by the distortion of radio signals. The basic principles of radio-wave reflection and electromagnetic waves had been established by another Scot, James Clerk Maxwell. Watson-Watt became the superintendent of the radio division of the National Physics Laboratory in Teddington. In 1936 his radio stations were able to detect aircraft up to 70 miles away. He persuaded the government to set up a network of radar stations to provide early warning of aircraft attacking over the English Channel. "Radar" was short for "radio detecting and ranging." It was due to radar that the over-stretched resources of the RAF were able to be in the right place at the right time as Luftwaffe aircraft streamed over during the Battle of Britain from August to October 1940. 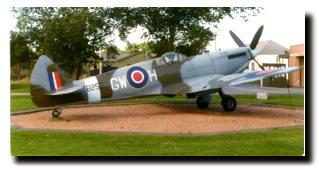 The Germans could not understand why the defending aircraft (such as the Spitfire, illustrated above) were so often there to meet them. In 1942, after the Battle of Britain was over, Watson-Watt (he had hyphenated his name by this time) was granted a knighthood. In 1952, he was given 50,000 pounds by the British Government for his contribution in the development of radar. He was also awarded the US Medal of Merit. Watson-Watt spent much of his life after the war in Canada and he died in Inverness in 1973.